Justus Childs; J.M. 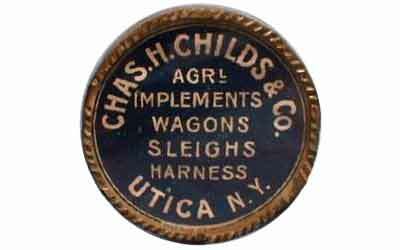 Childs and Co., 1850s-1870; Charles H. Childs and Co., 1870-1910; Utica, New York. Justus Childs was born in Woodstock, Connecticut on September 21, 1809 to Dolphus and Chloe Jackson Child, and came to Paris, Oneida County, New York in 1831. He resided east of Cassville on the stone road, and was an extensive farmer — his farm being one of the "model farms" in town. He was a direct sixth generation ancestor of Benjamin Child, who came to America from England about 1630 and died in Roxbury, Mass., in 1678. A valuable family genealogy, published in 1881 by Reverend Elias Child, of Utica, New York gives the unbroken lineage of his descendants, many of whom were prominent in civil, commercial and military life. He married Betsey Budlong, the daughter of Joseph Budlong, Esq., of Bridgewater, N.Y., on Sept. 21, 1834 and to the blessed union were born 6 children: Sarah Louisa Childs. (b. Nov. 18, 1835 – d. Oct. 20, 1870); Joseph Morris Childs (b. Apr. 17, 1840); Wallace Budlong Childs (b. July 8, 1842-d. 1870); Orlando Justus Childs (b. July 25, 1844); Kate Elizabeth Childs (b. July 10, 1848); and Charles Henry Childs (b. Dec. 26, 1854). In 1843 Justus served a single term in the State Assembly and in 1857 was elected Supervisor of the Town of Paris for a single term. During the interim he established himself in the manufacture of agricultural implements in the city of Utica, Oneida Co., N. Y. The business grew on his hands to large proportions, taxing his energies to an extent which seriously impaired his health. In the prime of manhood and amid business activities, he fell into a decline which terminated his useful life on May 24, 1868, at the age of 59. "He was gifted with superior intelligence and an excellent constitution; and was characterized by active habits and large business capacity, with marked public spirit. Always one of the most prominent citizens of his town, he was repeatedly its Supervisor, and also represented his district in the State Assembly. In all the relations of life, as well as in an official capacity, his conduct was distinguished by integrity, conscientiousness and good judgment, and his death will be lamented by all who knew him. He leaves a large family, among whom are Messrs. J. M. and W. B. Childs, of Utica, and a large circle of friends, to mourn his loss." Joseph Morris and Orlando Justus Childs, were the immediate successors of their father in the firm's Fayette St. factory, taking over management of the firm when their father fell ill soon after the start of the Civil War. Wallace Budlong Childs decided against it, electing to attend Hamilton College, Clinton, N.Y. where he pursued a law degree, graduating in 1864. Unfortunately his career was short-lived as he passed away in 1870, just two years after his father. Charles H. Childs, the youngest of the four Childs brothers, joined the firm after the death of his father and for the next decade the three brothers carried on a successful business in both the wholesale distribution and manufacture of numerous agricultural products. 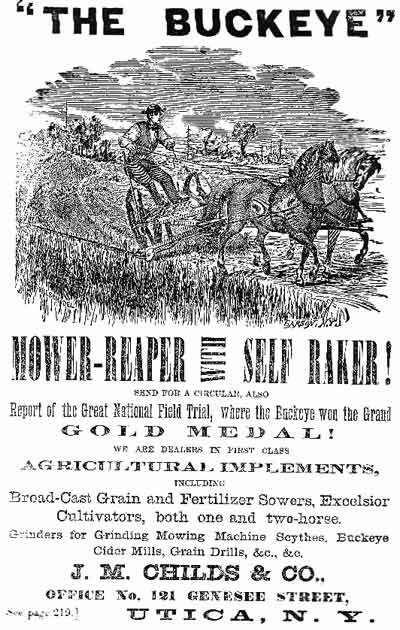 "Awarded the HIGHEST PREMIUMS, both in Mowing and Self-Raking, at the most important field trials ever held in any country. "OVER 130,000 NOW IN USE. 30,000 SOLD IN A SINGLE SEASON. "The success if the BUCKEYE as a SELF-RAKER is unparalleled. Very important improvements have been added for the season of 1870. "We are about to fill a large store with all kinds of first-class Farming and Agricultural Implements, Seeds, Fertilizers, &c, &c.
"Persons in want of any farming tool will please call on us and make their own selections. Send for a Circular. J. M. CHILDS & CO."
"Graham, Emlen & Passmore, Philadelphia, Pa., by J. M. Childs & Company, Utica, N. Y.; the Philadelphia lawn mower; three sizes hand machines; No. 0, 10 Inches cut, price fifteen dollars; No. 1, fifteen inches cut, twenty-five dollars; No. 2, twenty inches cut, thirty five dollars; two sizes for horse-power; No. 2 ½ , thirty inches cut, seventy-five dollars No. 3, thirty-six inches cut, $150." "The Buckeye," J. M. Childs & Co., proprietors, office 10 and 12 Lafayette Street, Utica. It is hardly worth while to discuss the merits of this celebrated Mowing and Reaping Machine, at this late day. So perfect and complete was the Machine as originally invented, that its principles have never been changed. Improvements in parts, it is true have been made, as experience showed them to be requisite. When it is understood that notwithstanding the great number of machines thrown upon the market for public favor, more than 130,000 of the "Buckeyes" have been sold, it will be universally conceded that the majority are in favor of this as a labor saving implement. We will not attempt to detail its merits, but would recommend the reader to call and inspect the machine for himself, or send for a circular to J. M. Childs & Co., Utica. Messrs C. & Co., also keep on hand a full assortment of Agricultural Implements, such as Threshing Machines, Fanning Mills, Horse Rakes, Cultivators, Plows, Cider Mills, &c., &c.
"J.M. 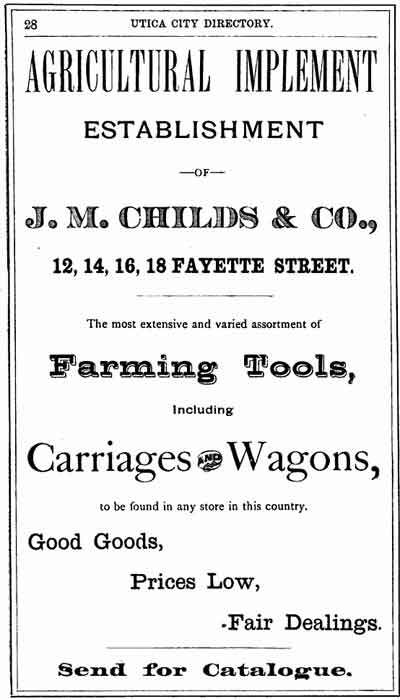 Childs & Co: Manufacturers and dealers in all kinds of farming implements : 12 and 14 Fayette Street, Utica, N.Y. : Call and see the best steel plow, and largest variety of implements in the state, 8 page catalog printed by Curtiss & Childs, steam job printers, 167 Genesee St., Utica, N.Y., 1873." "The VICTORIOUS 'Wisner' IMPROVED was awarded the Gold Medal at the Great National Field Trail near Philadelphia, Pa., 1874, Also AMERICAN INSTITUTE MEDAL, Same Year. "The Horse Rake and Mower are important Implements on the Dairy Farm. When the Revolving Rake was first introduced, it seemed that perfection had been reached in the way of gathering hay; but soon the Sulky Steel Tooth Rake put in an appearance, crowding out the former, and now the "WISNER," steps in and is bound to supersede all others. The Inventor, J. E. Wisner - of Friendship, N. Y. (owner of one of the finest Dairy Farms in Western N. Y. 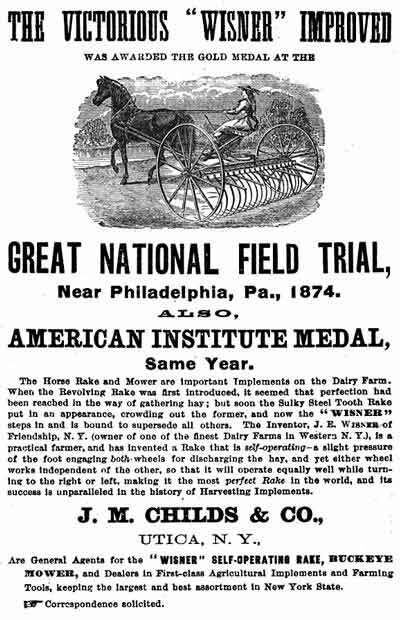 ), Is a practical farmer, and has invented a Rake that is self-operating—a slight pressure of the foot engaging both wheels for discharging the hay, and yet either wheel works independent of the other, so that It will operate equally well while turning to the right or left, making it the most perfect Rake in the world, and its success is unparalleled in the history of Harvesting Implements. 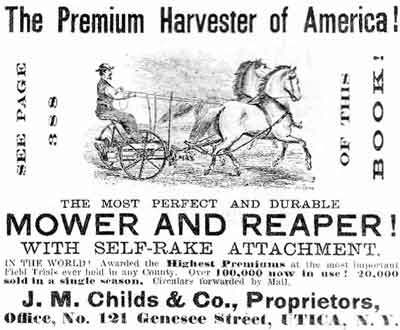 "J. M. CHILDS & CO., UTICA, N. Y., Are General Agents for the "WISNER" SELF-OPERATING RAKE, BUCKEYE MOWER, and Dealers in First-class Agricultural Implements and Farming Tools, keeping the largest and best assortment in New York State. Correspondence solicited." On Dec. 10, 1874 Orlando J. Childs married Ella A. Jones, daughter of Jonathan Jones, a well-known distributor of dairy equipment located in Utica, N.Y. Soon afterward he sold his interest in the family firm to his brothers, entering into a partnership with his brother-in-law, Frank Jones, under the name of Childs & Jones, successor to Jonathan Jones & Co., embarking on a successful career as dealers in dairy apparatus and general hardware at 84 Genesee St., Utica, New York. The withdrawal of Orlando from the family firm caused a reorganization of J.M. Childs & Co. with J. Morris Childs the senior, and Charles H. Childs, the junior partner. CHILDS J.M. 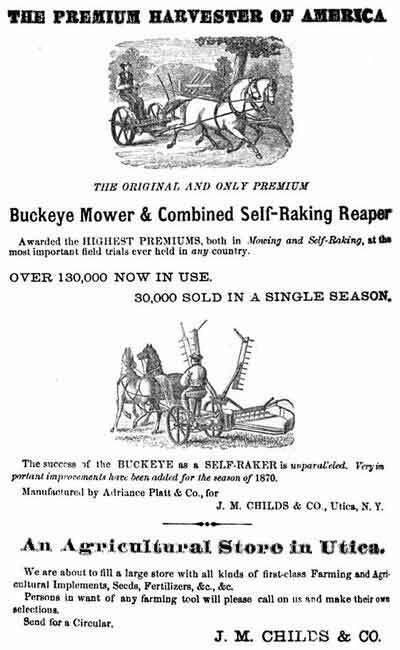 & Co. (J. Morris and Charles H.) Buckeye X Mower and Reaper and agricultural implements, 12 to 18 Fayette. See adv't page 28. CHILDS & JONES (Orlando J. Childs and Frank L Jones) dairy apparatus, hardware, & c. 84 Genesee, vat shop 30 Meadow. 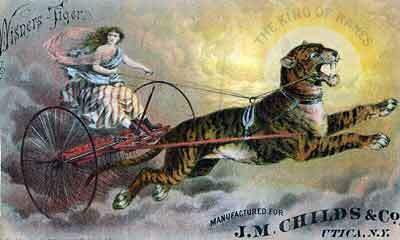 A chromolithograph advertising card dated 1884 depicts a woman riding a hay dump rake pulled by a tiger, text as follows: "Wisner's Tiger Sulky Hay Rake, 'the King of Rakes' manufactured for J.M. Childs & Co., Utica, NY." Charles H. Childs, the youngest of the four Childs brothers was a forward-thinking citizen, and became an initial investor in the People's Railroad, a Syracuse, New York street railway chartered April 22, 1887 that became operational on July 1, 1889. The total length of lines was 10.88 miles (17.51 km) with branches each 1 mile (1.6 km). On November 1, 1890, the company took a perpetual lease of the Central City Railway and the Syracuse and Onondaga Railway and those lines were merged into the People's Railroad Co.
By 1893, Peoples had rolling stock consisting of 31 box cars, 38 open cars and 204 horse cars. Its directors included; Anson N. Palmer, F. W. Barker, W. R. Kimball, W. P. Gannon, all of Syracuse, New York and Thomas Hunter, Charles H. Childs, F. J. Callanen, A. T. Goodwin, J. R. Swan, all of Utica. Officers of the company were president, Anson N. Palmer; secretary, Henry H. Durr of Utica; treasurer, F. W. Barker; superintendent, John H. Moffitt, both of Syracuse where the company general office was also located. In 1896, the company merged into Syracuse Rapid Transit Railway. In September 1890 Charles H. Childs organized the National Harrow Company of New York, one of the numerous manufacturing trusts that were being organized at the time in order to cut costs, fix prices and minimize competition. Joining him in the so-called 'spring-tooth harrow trust' were the following: D. C. & H. C. Reed & Company, of Kalamazoo, Mich.; G. B. Olin & Company, Perry and Canandaigua, N. Y.; Chase, Taylor, & Company, Lawrence & Chapin, both of Kalamazoo, Mich.; A. W. Stevens & Son, of Auburn, N. Y., and Child's own firm, J.M Childs & Co. Patents owned by the six firms were transferred to National Harrow and for the next few years the trust effectively controlled the manufacture and distribution of harrows across the country, making its members quite wealthy. The scheme came to an abrupt end at the turn of the century after President William McKinley put together the U.S. Industrial Commission, an agency given the task of identifying and breaking up the monopolistic trusts that now controlled most of country's manufacturing. The report of the Commission was seized upon by Theodore Roosevelt, who based much of his early presidency on "trust-busting". The creation of National Harrow coincided with the retirement of Joseph Morris Childs and the reorganization of J.M. Childs & Co. as Chas. H. Childs & Co. One of the new firm's popular products was the bellows duster or "bee smoker" which were marketed under the 'Electric' brand. Constructed of wood, leather and brass, a surviving example measures 27 1/2 long by 6' wide. In addition to agricultural implements, the new firm also distributed wagons and buggies, many of which were built in the firm's Fayette St. factory. The firm issued a 51 page catalog in 1895 entitled "Carriages, wagons perfectly designed, elegantly finished - Chas. 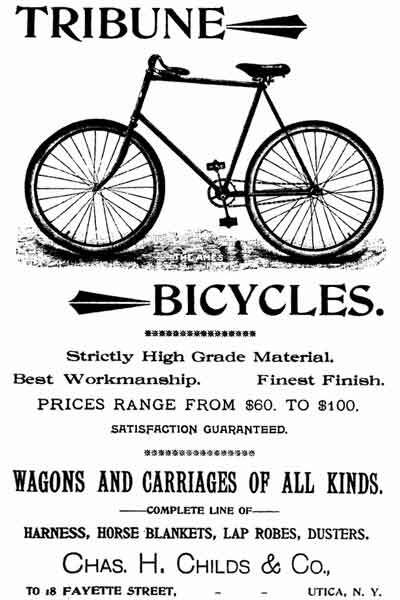 H. Childs & Co., Utica N.Y." Childs also manufactured Savoy-brand safety bicycles (1896) and is listed as the distributor of Irving-brand bicycles 1896. The firm progressed from the manufacture of carriages to automobile bodies just after the turn of the century. 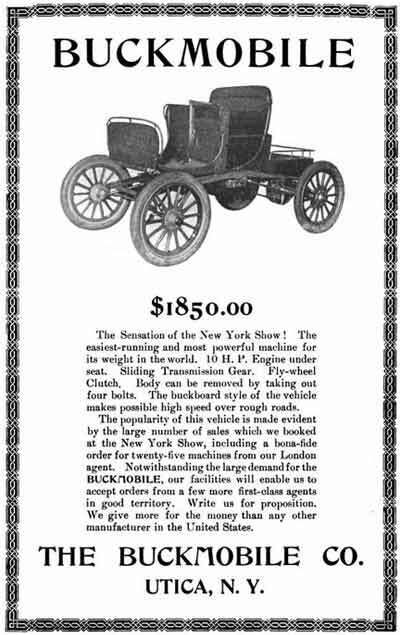 Childs is known to have supplied the simple all-wood coachwork for the Utica, New York-built Buckmobile roadsters and runabouts of 1903-1905. "The Buckmobile Company, of Utica, N. Y., has been incorporated by A. V. Brower, W. H. Birdsall and A. J. Seaton to succeed the Utica Automobile Company." 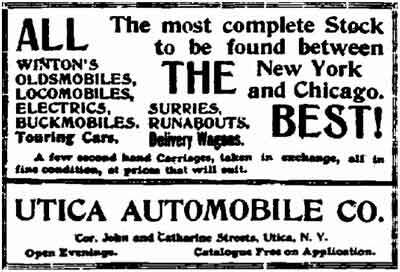 Existing advertisements reveal the Utica Automobile Co., located at the corner of John and Catharine Sts., Utica, N.Y., remained in operation into 1903 as a retail automobile dealership offering "ALL THE BEST" Wintons, Oldsmobiles, Locomobiles, Electrics and Buckboards. W.H. Birdsall designed the Buckmobile in 1901 and A. Vedder Brower and a local group of investors organized a company to manufacture the 2-cylinder car. Officers of the firm included: A. G. Brower, president; Samuel Campbell, vice-president; and A. V. Brower secretary and general manager, its Directors: A. G. Brower, A. V. Brower and Samuel Campbell. 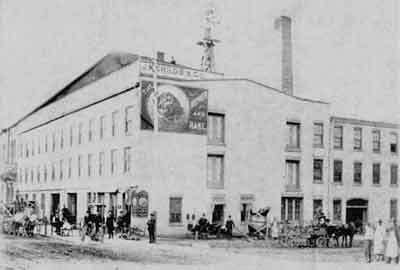 The first Buckmobile factory was located just two blocks away from the Childs carriage works at the intersection of John and Catherine streets. Production soon exceeded the capacity of the small plant and Buckmobile relocated to larger quarters located at 708 Genesee St. at the intersection of Shepherd Place, Utica. 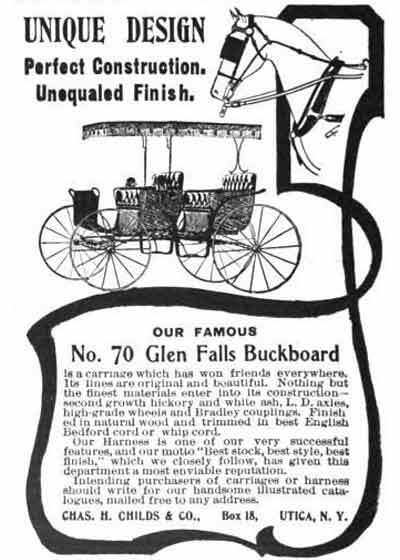 "The Buckmobile Company, 708 Genesee street, Utica, N. Y., exhibited one of their Buckmobiles in natural wood finish, which was much admired. The feature of this car is its long wheel base (80 inches), and the construction of the running pear, which gives easy riding and permits high speed over rough roads. The tread is 4 feet 6 inches and the wheels are either wile or artillery wood construction, as ordered. Either lever or wheel Steering can be furnished. "The motor is an upright, double cylinder, gasoline engine of 10 actual horse power. It has 4 3/8- inch bore and 4 ¾-inch stroke, and is geared 3 to 1. A sliding gear and clutch transmission is used, which gives two forward speeds and reverse. The speed of the engine is controlled by throttling the gas and advancing the spark. Splash lubrication of the engine parts is employed. "Roller bearings are used throughout. A double-acting brake acts on the differential. The gasoline capacity is 6 gallons, which will run the car 100 miles over ordinary roads. Speed is 25 miles per hour. The buckboards are of second-growth ash, air dried. They rest on two large, strong leaf springs, extending from axle to axle. The body can be removed by disconnecting the brake clutch and taking out four bolts. The large friction clutch is self-adjusting and is of sufficient strength to transmit 35-H.P. The engine is copperjacketed and has roller bearings. The inlet and exhaust valves are easily accessible." "Buckmobile Co.—One runabout is exhibited, finished in oak throughout. The frame is carried on two side springs. The platform has, in addition, two wood supports resting on each axle, almost parallel with the springs. The front axle, to accommodate the wood supports, is bent upward a short distance from the yokes, then is run across, forming an arch and allowing of more than ordinary clearance. The engine is of the double cylinder vertical variety, rated at 15 horsepower and carries a planetary gear on the outer end of its shaft. Two speeds forward and one reverse are provided for, and controlled by one lever. All valves are mechanically operated. Split rear axle, with single chain drive, is used. A surrey seat, detached, is exhibited, it being intended to mount on the platform back of the main seat. This is also finished in oak. "Slaton, Henderson & Gillies have taken the New York agency for the Buckmobile Co. and will conduct their business under the title of the Buckmobile Co. They have just had completed for them a fine two-story brick garage at 1900 Broadway. Mr. Gillies says the parent company will bring out this season a 16 horsepower car with vertical motor, planetary transmission and wheel steer." "The Black Diamond Automobile Co., a New York state corporation with $500,000 capital, has made arrangements to consolidate with the Buckmobile Co., of Utica, N. Y. It will continue to make practically the same machines as are now being made by the Buckmobile Co. Dr. A. G. Brower and son, A. V. Brower, will hold the same official positions with the company that they have filled with the Buckmobile Co. They will be largely interested in the company. William Dieter, the Black Diamond Automobile Co.'s mechanical engineer, now has full charge of the Buckmobile Co.'s works, which have been enlarged. The Black Diamond company has also purchased the Remington plant, which is situated in Utica. This is a large, well equipped plant and will be operated to its full capacity." "The Seaton Automobile Company, of Utica, N. Y., has been organized and has purchased the plant of the Black Diamond Automobile Company on Sunset avenue. A modern garage and repair shop will be established with a capacity for storing 101 cars. A. J. Seaton, former president of the Buckmobile Company, is the manager of the new concern." Philo E. Remington (b.1869-d.1937), the wealthy grandson of Eliphalet Remington, founder of the world-renowned Remington Arms Co. of Ilion, New York, was involved in a number of stillborn early automobile manufacturers prior to the First World War, the self-named Remington (1) amongst them. His first firm, the Ilion Motor and Vehicle Co., (Philo E. Remington, Charles B. Storrs, and William A. Lord directors) was organized in Orange, New Jersey in 1899, in the hopes of manufacturing a vehicle in his hometown of Ilion, New York. After financing fell through, the Utica Chamber of Commerce spearheaded a move to relocate the firm to Utica and on August 3, 1900 the Ilion Motor and Vehicle Company was reorganized by its directors Philo E. Remington, Charles B. Storrs, and William A. Lord as the Remington Automobile & Motor Company with an authorization to issue $250,000 in capital stock. The new firm's officers were as follows: Philo E. Remington, president, S. C. Burch treasurer, and P. A. Stubblebein secretary. Also included in the deal were the assets and machinery of the Quick Motor Co. of Newark, New Jersey who had recently developed the Phelps motor, a DeDion-style engine that would provide the power for the proposed Remington automobile. Remington's board agreed to relocate its manufacturing plant from Ilion to the City of Utica after George I. Dana, president of the Utica Chamber of Commerce, provided them with a suitable property and helped raise $30,000 through a subscription of Remington stock. 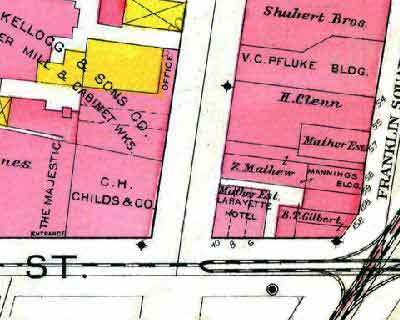 Local suppliers included Willoughby, Owen & Company (bodies) and Weston-Mott (wheels and axles) and the firm's assets relocated to a vacant 3-story factory on First Street, in downtown Utica. Despite the fact the firm had produced only a handful of prototypes its famous founder helped garner much needed publicity as evidenced by a flurry of mentions in the automotive trades between 1900 and 1902 which follow. "The Remington Automobile and Motor Company informs us that the streets of Ilion. N. Y., are covered with 18 inches of snow, and that its vehicles, weighing 1,200 pounds, and equipped with a 4 horse power motor, are operating successfully over these streets." "The Remington Automobile and Motor Company expect to locate at Utica, N. Y." "The Remington Automobile and Motor Company announce that soon after their removal to Utica, N. Y., they will add a marine motor and launch department. Louis Graham has been elected treasurer." "The Remington Automobile and Motor Company, Utica, N. Y., expects to turn out its first carriage about June 1." "Remington Standard 'A Good Motor with a Good Name'. Positioned for either automobiles or launches, Remington Automobile and Motor Co. Utica, NY." "We have received a catalogue from the Remington Automobile and Motor Company, of Utica, N. Y., illustrating and describing the Remington automobiles, launches and motors." "The Remington Automobile and Motor Co., of Utica, N. Y., have brought out a four cycle two cylinder gasoline motor specially designed for marine work. They have recently equipped a twenty foot boat named the "Remington" with one of these motors, and the operation has proved satisfactory. It is 4 H. P., and the company intends to manufacture these motors in large quantities in several different sizes and equip yachts and launches of all kinds." "The Remington Automobile Motor Co., manufacturers of the Remington Standard automobiles, launches and motors, are now settled in their new factory at Utica, N. Y. They have just issued a very attractive little catalogue telling all about their products, and it is well worth sending for, as it contains a fund of valuable and interesting information. The same class of fine workmanship is put into Remington automobiles that has made the name a world wide synonym for mechanical excellence in rifles, typewriters and other products of the factory." "A Generous Offer from The Remington Co.
We are repeatedly asked if we are going to take part in the coming long distance automobile test or endurance' run. We are entirely too busy manufacturing motors and complete vehicles, to fill our orders, to permit us to take any of our production for this endurance test, though we desire to assist to make it a success, in so far as we can, and as Utica will be one of the principal stopping places, we would like it known to the trade that our entire plant will be placed at the disposal of any contestant who finds himself in trouble upon his arrival in Utica." "At the annual meeting of the stockholders of the Remington Automobile and Motor Company held at Orange. N. J., recently the following directors were elected: Philo E. Remington, of Ilion; George I. Dana, Correl Humphrey, G. A. Spaulding. L. M. Graham and J. S. Holmes, Jr., of Utica, and Charles B. Storrs, of Orange, N.J."
"The Remington Automobile and Motor Manufacturing Company of Utica, N. Y., are getting out a 12 horse power tonneau for C. S. Mott, of the Weston-Mott Company, same place." "REMINGTON AUTOMOBILE AND MOTOR Co., Utica, N.Y.
"Sept 10 '01, Remington Automobile & Motor Company, Sold to Mr. C. S. Mott, Weston Mott Co., Utica, N.Y.
"Remington Automobile & Motor Co., L. Malcolm Graham Treas." Mott drove his Remington in a "Horseless Carriage Run" in 1902. He was a charter member and first president of the Automobile Club of Utica, and he was one of the founders of the American Automobile Association in Chicago. On September 4, 1902, Mott traded in his first Remington, being credited not only with the full amount of the original purchase price, but also receiving an additional allowance of $135 for "running gear, steering levers, wheels, tires, and compensating gear" which he had furnished for that first car. The net difference he paid for his new "special 1903 Remington" on September 4, 1902, was $140.75. "Mr. Philo E. Remington, president of the Remington Automobile & Motor Co., of Utica, N. Y., states that he left Albany in a 26-foot Remington launch, equipped with a Remington four cycle motor, for the purpose of making a record trip from Albany to New York. The time of leaving Albany it is said was 3:30 a. m., which time is certified to; and the time of arrival at 152nd Street, North River, New York, was 6:30 p. m. the same day, which arrival is likewise certified to. Mr. Remington reports that the motor never stopped once during its entire trip, thus having run continuously for fifteen hours during the entire distance of one hundred and fifty miles. "It is stated that the company have recently made a gasoline consumption test of that same boat with the results that twenty gallons of gasoline were used in traveling three hundred and twenty-five miles." "Proceedings in involuntary bankruptcy have been taken against the Remington Automobile and Motor Co., Utica. N.Y."
Although Remington was embarrassed by the firm's bankruptcy, he went on to front three more auto-related enterprises. The first was the Remington Standard Motor Company (1910-1912) of Charleston, West Virginia and Farmingdale, Long Island - so-named to take advantage of the familial connection to the Remington Standard typewriter, another popular device manufactured by his famous grandfather. Although there was no affiliation between any of Philo E. Remington's automotive enterprises and the firms founded by his grandfather, investors probably assume that there was, despite the fact that the Ilion, New York-based Firearms and Typewriter enterprises were no longer controlled by the family. The Remington Standard was less successful than the first Remington, with Kimes and Clark stating only a prototype truck is known to have been produced before the enterprise was shut down by the receivers. However, Philo E. Remington remained undaunted forming yet another firm named after his family, the Remington Motor Co., in 1913. The last of his of self-named automotive enterprises, the Rahway, New Jersey–based firm introduced a sophisticated Remington cyclecar in 1914 that was equipped with a 107 cu. in. 4-cylinder engine, shaft drive, and a Hollister pre-selective automatic transmission. In 1915, a larger 116-in wheelbase model debuted powered by a V-8 engine. It was reported in the trade that Philo E. Remington designed the cars himself. "A corporation known as the American SleeveValve Motor Co., with executive offices at Philadelphia, Pa., is preparing to manufacture a new sleeve-valve motor. E. Remington, of arms and typewriter fame, is chairman of the board; Philo E. Remington, of the same family is president, and Wilfrid Hartley, formerly treasurer and factory manager of the Remington Arms Co., is vice-president. Among the other officers and directors are E. R. Hollander, former president of the American Fiat Sales Co.; T. M. Fenner, of the Wisconsin Motor Mfg. Co. and C. P. Hollister, formerly with the Stanley Electric Co."
No further information on the firm was forthcoming and it is believed that the firm never built any engines of any type. Philo E. had recently become enamored with the phonograph record, and his next firm, the Remington Phonograph Co., organized in July of 1920, actually produced a handful of operatic titles under the Reminola and Olympic labels from its factory and recording studio in Long Island City, New York. Once again, Philo failed to take into account the overwhelming competition and the firm was bankrupt within the year and subsequently reorganized as the Remington Radio Corporation in June of 1922. Once again the firm failed shortly thereafter after Philo E. Remington and his officers and directors were indicted for conspiracy to use the mails to defraud in relation to sale of Remington Phonograph Co. stock. Evidence suggests that to one degree or another fraud played a part in the formation of all of his earlier automotive enterprises although this time he got caught red-handed. After almost two years of litigation, the case abruptly ended on June 14, 1924 when a Federal judge ruled that the indictment against the men was faulty. "Charles H. Childs & Co., of Utica, N. Y., are just completing in that city a new garage which they believe to be the finest between New York City and the West. It is located in the central part of Utica and is 90 by 100 feet in size. It will be equipped in the most up-to-date way throughout." "Chas. 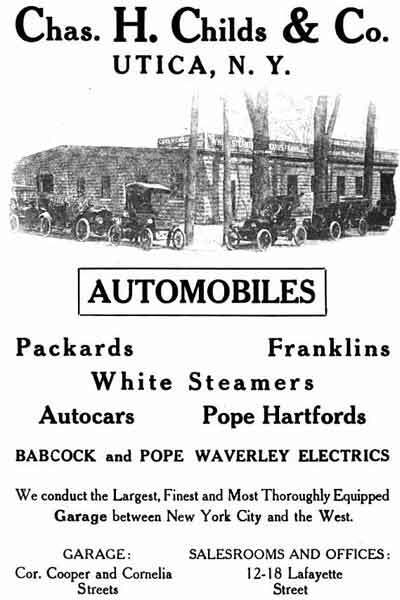 H. Childs & Co. UTICA, NY AUTOMOBILES - Packards, Franklins, White Steamers, Autocars, Pope Hartfords, Babcock and Pope Waverly Electrics. We conduct the Largest, Finest and Most Thoroughly Equipped Garage between New York City and the West. Garage: Cor. Cooper and Cornelia Streets, Salesrooms and Offices: 12-18 Lafayette Street." "Childs & Co., Chas. H.—12 Lafayette St.. Utica, N. Y. (Packard, Franklin. Pope-Waverley, Pope-Hartford, White, Autocar.) Garage." Childs was later listed as distributors of the Oldsmobile and Jackson (Jackson, Mich.) automobile. However the firm's short career in auto sales came to an abrupt end in 1910 when the City of Utica decided to erect a new modern hotel. The city needed a first-class, fireproof hotel and needed one ASAP. The Utica Saturday Globe wrote that commercial travelers and tourists were planning their trips so as to avoid spending the night in Utica because of poor accommodations. A group of Utica business leaders – led by brewery owner F.X. Matt – decided to build a 10-story, 350-room hotel in downtown Utica next to the recently constructed (1899) Majestic Theatre. The site selected was on the northwest corner of Lafayette and Seneca streets, the location of the factory where Charles H., J. Morris and their father Justus Childs had produced farm tools, wagons, carriages, bicycles and automotive coachwork for the past 60 years. 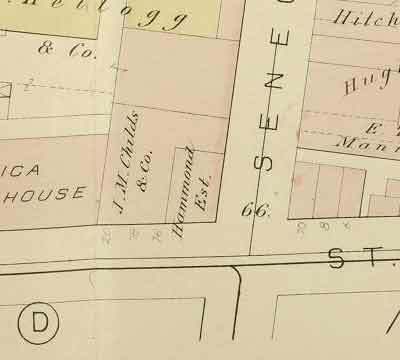 The factory was sold to the city and demolished, and the firm's automobile offices relocated to its recently constructed facilities at the corner of Cooper and Cornelia Sts., near Coumbia St., Utica. 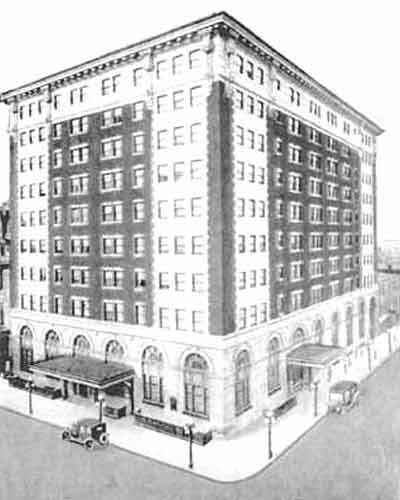 Built on the site of the Childs' factory starting in February of 1911, the $900,000 Hotel Utica was completed in time for its March 11, 1912 grand opening. The Renaissance Revival-style structure featured fireproof construction with 200 rooms, four dining rooms, a ballroom, an assembly hall, a restaurant for ladies and a grill and cafe for gentlemen. It is due to celebrate its first century in business in the upcoming months and following a recent renovation continues to provide visitors to Utica and the Mohawk Valley first class lodging and dining opportunities. Charles H. Childs retired soon after the sale of the factory.